In the make-or-break days of the American Revolution, Washington’s army was encamped in the bitter, freezing winter of Valley Forge, Pennsylvania. The wind howled, the snow fell, and if this revolution was to die, it was here. The army had yet to win one major battle and they were out of everything … no guns, no ammunition, scant clothing and, worst of all, no food. They had boiled whatever leather they could scavenge from saddles to boots and eaten it just to fill their stomachs. I mention this bit of history because the other night I was watching the Lakers playing on television. The game had already been decided in the middle of the third quarter by the Lakers’ insurmountable lead. My laptop computer and the Internet now held my attention, but in the waning minutes of the game, I heard a chant start to build from the fans. “TACOS, TACOS, TACOS,” cried the fevered fans. What the hell? It turns out that Jack in the Box was running a promotion. If the Lakers held their opponents to under 100 points, everybody in the arena would get a free taco. When the final buzzer sounded and the bad guys had scored only 98 points, the crowd erupted in a roar heard in every Jack in the Box in the state. That night, the crowd had achieved the American dream – free tacos. A new chant had come to define America: “TACOS, TACOS, TACOS.” To think, this all started with Fritos. It used to be that you could go to the supermarket and your choice of chips was limited to potato chips or Fritos. Fritos were as American as apple pie and nobody stopped to think, “Hey, Fritos is a Spanish word meaning fried or toasted.” No, they were just Fritos. They came with your school lunch and with them you could make Frito pie (yum). From there, chips evolved very quickly from Fritos to Tostitos to Doritos. The popularity of these new, potato-less chips was due to their symbiotic relationship with another, newly adopted Mexican staple – guacamole. The chips got bigger and stronger in order to scoop more “Guack.” It was the survival of the dippiest. The development of the chip presaged the new paradigm in the battle of snack foods. Mainstream food companies were not going to just sit around and become overrun by delicious foods from south of the border. Potato-less chips were bad enough – grilled cheese sandwiches eventually found themselves replaced by, of all things, the quesadilla. What could be done to combat this Mexican menace? I decided to try one just to say that I have now tried everything. Those kinds of food have their own special island in the supermarket – well lit with their own Latino-flavored Muzak emanating from overhead. I approached with caution. There they were so healthy looking, it made me sick. I was just about to pick an imitation crab, beet, radish and endive mix stuffed into a parmesan flaxseed tortilla when something caught my eye … soups! There was something different about them. I scanned down the line. All the usual suspects were there: cheese and broccoli, chicken vegetable, lobster bisque, and menudo. Menudo? What was menudo doing here on Gourmet Island? For the uninitiated, menudo is not just a Latino boy band. Menudo is a Mexican soup made out of tripe and hominy. It is the ultimate hangover cure and test of Mexican manliness. If you didn’t grow up eating it, there’s no way you can eat it for the first time as an adult unless you’re Tommy Chong (but everybody always thought he was a Chicano anyways). Menudoooooo! I started to eat it right there, the wrap a distant memory by now. A little oregano, a little onion, some chili flakes, and a good squeeze of lemon. There I was gliding through the produce isles riding my shopping cart like Aladdin on a magic carpet – except with menudo juice dripping off my chin. Then something else caught my eye. There, in the meat section, was a whole display of chorizo! However, Jimmy Dean, not Don Juan, made this chorizo. Corporate America had fully embraced Mexican cuisine. They had thrown in the tortilla. It was a great day in America. This called for a beer. I raced my cart to the end of the aisle and crashed into a display of some new kind of beer that Budweiser was promoting. I picked up the last can to hit my head and read the label: “Chelada,” it said in wavy Mexican script. Chelada is a distinctly Mexican concoction of beer, clamato juice, and lime. This can’t be happening – it’s too good to be true. “Que overkill,” I thought. 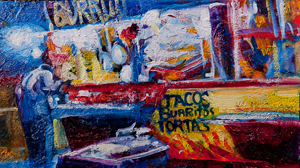 Image Credit: “Los Taqueros” by Margaret Garcia, 2012 (oil on wood panel, 8″h x 11.5″w x 4″d). Courtesy of Cheech Marin Collection.